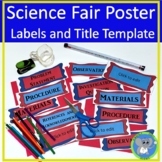 Headers for science fair display boards... elementary level labels. 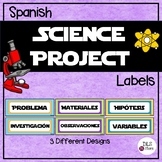 Science Fair Project Labels FREEBIE! 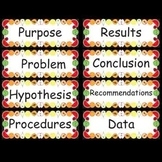 Colorful labels to outline the scientific method on a project display board. 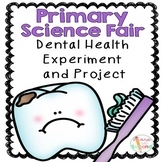 Perfect for a science fair. 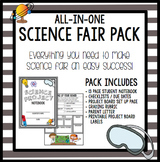 Labels included are: problem, hypothesis, materials, procedures,observation log, graphs/charts, and conclusion. 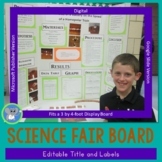 Pre-made cards for labeling sections of your Science Fair Board. 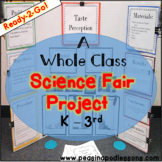 I created this project when my first grade class participated in our school's science fair. Our question was "Is hot water bad for plants?" The requirements for the science fair were: display board (with title, purpose, hypothesis, materials, procedure,and results), log book, and written report.